Our Facilty features both private (shown) and semi-private accommodations. We encourage families to decorate the rooms to make our residents feel comfortable by being surrounded by familiar objects. Each room is equipped with a phone jack, cable TV and WIFI is included. 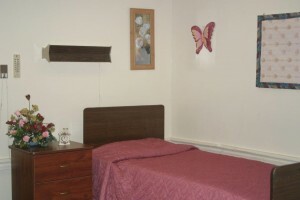 Kerr Lake Nursing and Rehabilitation Center has two large dining/day rooms with TV, DVD player. There is one on each level as well as a sitting room at the main entrance where residents can just visit or enjoy both independent and group activities. 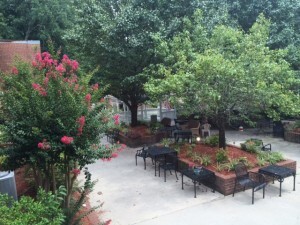 Our facility also has a spacious patio for residents and families to enjoy. 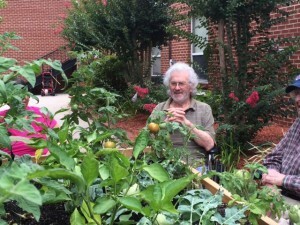 During the spring and summer months, the residents enjoy working in a raised garden. Residents are allowed to choose their daily meals from our Select Menu. Once a month the resident council picks a special meal for all to enjoy. We have two large dining rooms, one for residents who are independent in eating and like to socialize with other residents and friends and another for residents who require some assistance or cueing. Residents are able to eat in their rooms if they prefer. Families and friends may purchase a tray to eat with the resident. A full time activity director and full time activity assistant provide activities on a daily basis, numerous volunteers from the community, use Wii, movie time, games to help sharpen mental abilities as well as to just have fun, spiritual activities including Sunday School, Church Services, and communion, exercise, outings to local restaurants, museums, the lake, movies, manicures, socials, parties. Annually we recognize our volunteers with a volunteer luncheon and Volunteer of the Year and Angel of the Year. The Activities Department also sponsors our annual cookout during National Nursing Home Week, the summer Ice Cream Social and a Christmas Open House where families and residents join in a celebration.